Flights search engine Nowfly.co.uk launched this week, offering fast and accurate results from a wide range of flight operators. There are already plenty of travel comparison sites out there; I have looked at both Travel.co.uk and Skyscanner in the last six months, so how does Nowfly compare? The Nowfly homepage, shown above, looks a little basic, but it is functional. The flights search box the most prominent item on the page, so visitors should figure out how to use the site very quickly. Compared to some other travel comparison sites, Nowfly doesn’t devote much homepage space to promoting latest deals or offering alternative methods of browsing for flights. There are a few example destinations in the centre of the page, but visitors will have to use the search box on Nowfly. 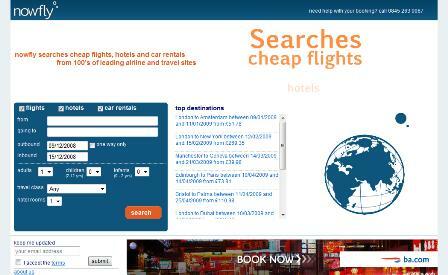 Other travel sites offer more browsing options, by destination, from a particular airport etc. I suspect that the vast majority of users of such sites will head straight for the search option, but more browsing options would be useful. Some web users may not like to make too much effort in entering dates and destinations, or may not have a particular destination in mind, offering more link navigation options and special offers may attract more of these customers. The search box has been kept simple, and doesn’t ask users for too many details before they can begin searching. There are no drop down lists of departure and destination airports and cities to choose from, so users have to type these details in the box, though an auto-suggest feature does kick in after three letters are entered. This feature is very useful on travel searches, especially for destinations where users may not be sure of the correct spellings, though it would be helpful to optimise the suggest feature for popular destinations. For instance, if I want a flight to Barcelona on Nowfly, after typing in the first few letters, I’d expect it to appear in the list, as it is the best known destination beginning with ’bar’. However, it doesn’t appear in the list; after typing in ‘barc’ for instance, I am presented with airports in Albania, Normandy and Romania, but not Spain’s second city. In fact, it doesn’t appear until I have typed in the whole name. This may be an oversight though, as the suggest feature worked better for most of the other destinations I entered. As for the rest of the search box, it is easy to use; the calendar pops up when you click on the box to enter a date, and other options are self explanatory. The search results match up to the claims in the Nowfly press release by indeed being ‘speedy and accurate’. A full list of results appears within a couple of seconds; faster than both Skyscanner and CheapFlights in my informal test. As for accuracy, the site produced a good range of results for the dates and destinations I selected without any errors. For airline flight results, the challenge is to display the key information effectively without confusing the customer with too much detail. Further sorting options are provided; customers can exclude particular airlines from their searches, sort by price, or by the number of changes required. Once a customer has decided on and selected an outbound flight, they move onto step two, which is to select the return flight, before transferring to the airline website to complete the booking. This is a newly launched site and I’m told there are other features to be added to provide more background detail and functionality for users. Nowfly has prioritised usability on the flight search, and has therefore kept it simple, though I think the homepage could be made more appealing to first time visitors. The flight search is easy to use, and returns a good range of results quickly, while flights are displayed in a way that is easy to understand. A few tweaks here and there could improve the site though, such as improving the auto suggest feature, providing a drop down list of destinations, and making it easier to users who prefer to browse through links for flights. The benefits of free shipping offers are well documented; it simplifies the charges in the customers mind, and is a proven sales driver. Luke Knowles from freeshipping.org has put together a free e-book (pdf) with some case studies and stats on free delivery. Has retailer Woolworths closed its website? Woolworths, having become the latest victim of the credit crunch yesterday, seems to have taken its website offline this afternoon. One of the first lessons in usability is that people vary and that designing for ‘average’ doesn’t work. Nowhere is this more true than in the highly competitive world of mobile phone design. Actually I don’t want a new mobile because I have an iPhone and I love it. Of course, it’s not perfect but once again Apple has demonstrated that it understands the importance of the ‘user experience’. Even its cardboard box is beautiful.